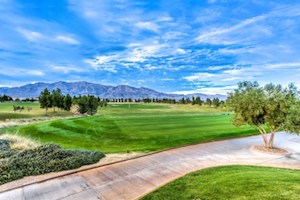 Sun City Aliante is an affordable Del Webb 55+ community just 15 miles from the Las Vegas Strip. Just 15 miles north of the Las Vegas Strip, Sun City Aliante offers beautiful homes and resort-style amenities. This 55+ active adult enclave is nestled within the larger Aliante community, at the base of the Sheep Mountain Range. Its prime location puts residents within easy reach of Las Vegas' world-class entertainment, yet on-site amenities also make it easy to stay active within the community. Sun City Aliante was built by Del Webb between 2003 and 2008. Today, it includes 2,028 single-family homes in a variety of sizes and styles. Residents of Sun City Aliante enjoy both their own exclusive amenities, as well as amenities found throughout the larger Aliante community. Sun City Aliante's exclusive clubhouse brings residents together with classes, clubs and activities. There is plenty of space for both planned and impromptu socializing, including the spacious clubhouse lounge and the multi-purpose activities room. The clubhouse makes it easy for residents to join a wide range of special-interest clubs or enjoy their favorite pastimes. Hobby and game rooms include an arts and crafts studio, a billiards room, a library, a computer lab, classrooms, a conference room and a multi-purpose social hall with table tennis. The 18-hole Aliante golf course offers exciting play for golfers along with on-site dining and a pro shop. The clubhouse also includes a fitness center with locker rooms, a sauna, an aerobics and dance studio, and an indoor pool and spa area. Fitness classes are also available for those who like to exercise in a group setting. These include aerobics, aqua Zumba, Pilates, tai chi, water aerobics, yoga and Zumba. Residents can enjoy the beautiful Nevada weather on the clubhouse's outdoor patio or by exploring the community's walking and biking trails. The grounds also feature three tennis courts, four bocce ball courts, two horseshoe pits and a picnic area. In addition to these exclusive amenities, residents also have access to recreational and social amenities in the larger Aliante community. These include the 18-hole Aliante golf course, the Mondell Pine Grille, the golf pro shop and the Nature Discovery Park. There are also tennis, basketball and volleyball courts, as well as softball and soccer fields. When it comes to homes, Sun City Aliante offers single-family designs ranging from 1,155 to 2,105 square feet. These lovely homes typically include two or three bedrooms, two full bathrooms and attached two-car garages. Some floor plans also feature separate dens, and porches or patios for outdoor living. One model, the Laurel, originally offered an optional casita. 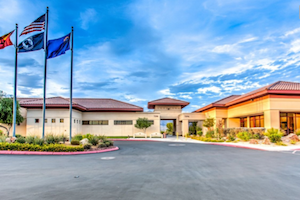 At Sun City Aliante, beautiful homes, resort-style amenities and a prime North Las Vegas location come together to create a fabulous retreat for active adult retirees.